Marcela Heineke, an ecology field technician with Schoodic Institute, adjusts a temperature gauge inside an experimental plot at the institute's research campus at Schoodic Point on Wednesday, Oct. 10, 2018. 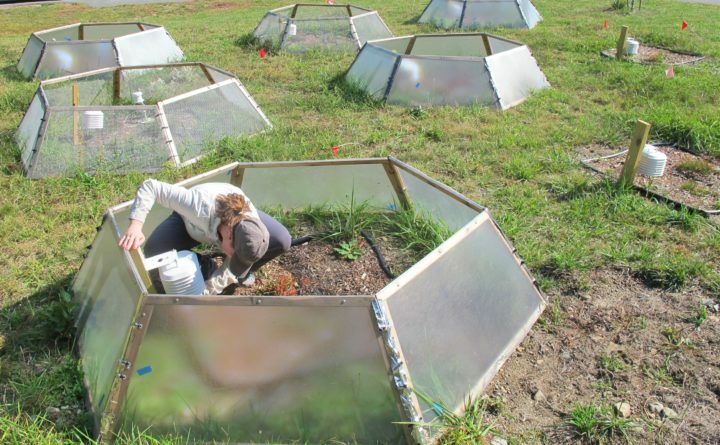 Scientists at the institute are growing low-bush blueberries and other plants inside the frames to see how vegetation in the park might be affected by a warming climate. ACADIA NATIONAL PARK — More people, different trees and higher tides are among the things people can expect at Maine’s only national park as a result of the changing climate, according to scientists at the park. Some of these changes already are noticeable, as the warming climate has helped to extend Maine’s tourist season into the fall, resulting in increasingly high visitation numbers at Acadia. The park’s estimate of more than 3.5 million visits last year — a record under the park’s current visitation formula — included more than half a million visitors in September and again in October. Park officials have attributed warm, dry weather in recent falls for the high numbers of people who visit Acadia after Labor Day. “October is a very busy month now,” Rebecca Cole-Will, the park’s head of resource management, said last week. Aside from the noticeable increase in visitors to the park, which has prompted Acadia to develop its first-ever traffic management plan, climate change is affecting the park in other ways, too. More severe weather is having an impact on park infrastructure and, in some cases, is aggravating the park’s $60 million deferred maintenance backlog. Though storms are not expected to become more frequent, they generally are becoming more severe, dumping heavier amounts of rain and often whipping up stronger winds buoyed by warming ocean temperatures. The combination of heavier rains and culverts that have not been properly maintained, for example, can result in road damage, as it did earlier this year when a clogged culvert caused part of Lurvey Spring Road to wash away during a heavy downpour. Unusually wet weather, a dramatic temperature swing and inadequate drainage last winter resulted in a large-scale flood at Sieur De Monts Spring, which then froze, creating an enormous skating area for outdoor enthusiasts but also damaging the site’s nature center building. 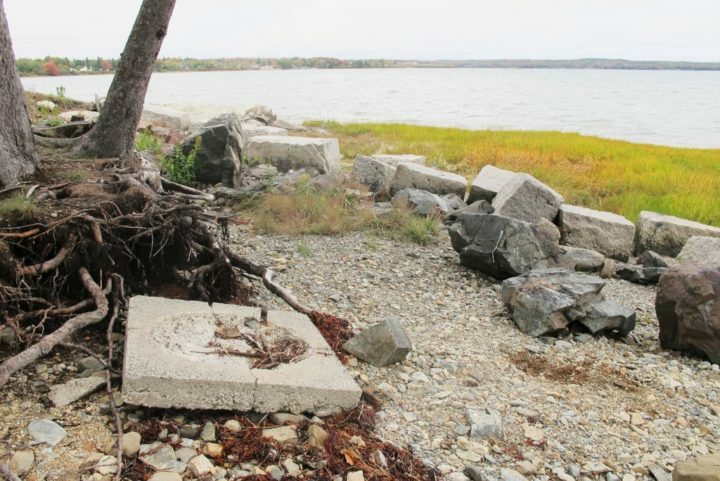 An old concrete fire pit rests on small rocks on the shore of Thompson Island after the soil around it has been washed away over many years by higher tides and increasingly severe storms. Rising sea levels are one way that climate change is expected to have a significant impact on Maine's only national park. At the picnic area on Thompson Island, off Route 3 between Trenton and Mount Desert Island, several old concrete fire pits have fallen onto the beach where they can get swamped by peak monthly high tides that are getting incrementally higher because of sea level rise. Newer fire pits have been installed on the lawn farther back from the water’s edge, but the old ones remain where erosion caused by stronger storms and the removal of trees long ago continues to eat away at the island’s low-lying turf edge. The park has been conducting more scenario planning as it tries to better anticipate what the extent of heavy rainfall or stronger storms might be at specific sites. A sea level rise of even several feet is not expected to change the acoustic dynamics of Thunder Hole, but what kind of long-term impacts there may be at Sand Beach are not clear. But even now, the carriage road and trail maintenance budget at Acadia has increased as it deals with more rain-driven erosion, and park plows are getting more wear and tear from scraping seaweed, cobble stones and other marine matter from low-lying roads that get washed over when stormy seas strike at high tide. Miller-Rushing said these and other expected changes have shifted the park’s managing approach from trying to preserve things as they are, to trying to minimize the impacts of climate change. For example, if park staff is planning to restore vegetation to an area, they once might have planted native species long found in Acadia, but now before planting they consider whether a native species might fare well in warmer weather or how wet or dry a restoration site could become. A car travels across a causeway on the Schoodic Loop Road in Acadia on Wednesday, Oct. 10, 2018. 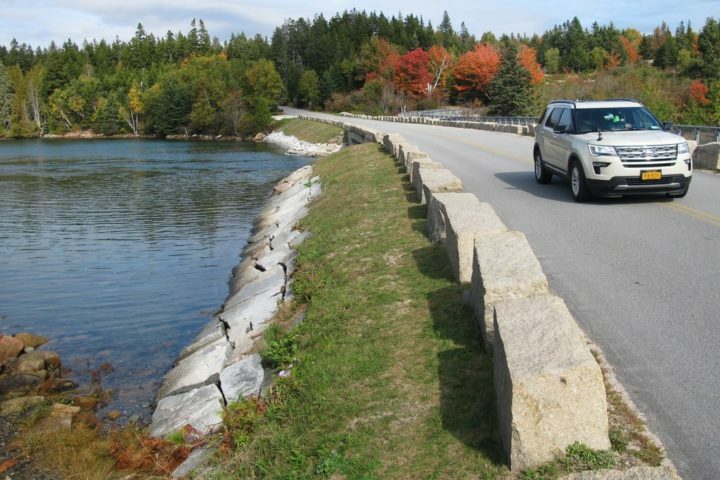 Such low-lying roads in the park, including where the Route 102A passes Seawall and where Park Loop Road crosses Otter Cove on Mount Desert Island, are among places in the park where infrastructure will be affected the most by rising sea levels, Acadia officials say. Nicholas Fisichelli, forest ecology director for the Acadia-affiliated Schoodic Institute, is involved in some of that research, overseeing field experiments to see how plants in the park might respond to changes in climate. Using sites at different locations and elevations, researchers are controlling growing conditions for sunlight and airflow to learn how trees, bushes and other vegetation will respond to warmer weather. Already, the park is seeing changes to its vegetation profile as the annual spring thaw arrives earlier in the year. The final frost on average is occurring three weeks earlier than it did 30 years ago, he said. Boreal species of trees such as the balsam fir, white and black spruce, and birch trees are among the varieties of trees that likely will decrease in Acadia as the park’s climate gets warmer, though not every part of the park will be affected the same way, he said. Red spruce, the most dominant tree species in Acadia and throughout Maine, thrives in cool, moist conditions, so is expected to be less affected at higher elevations or in areas such as Schoodic Point that are more exposed to the cooling influence of the ocean. Eastern white pine trees are not expected to lose habitat as Maine’s climate gets warmer but species at their northern limits in southern Maine such as oaks, chestnut or hickory trees could become more prevalent, he said. Invasive insects or significant changes in population of animals that eat seeds, such as squirrels and mice, also could affect Acadia’s plant profile. And it is not just a matter of average temperature. Even as more rain falls courtesy of wetter storms, seasonal droughts are expected to persist as the dry interludes between storms get more pronounced, which also will have an effect on vegetation. All of which, according to Miller-Rushing, ramps up the chances of dynamic changes occurring in Acadia over a short period of time. “The park service hasn’t really dealt with this kind of rapid change very often, and certainly not ever on this kind of scale,” Miller-Rushing said. If Acadia has a large die-off of trees, he said, park officials want to be somewhat prepared to replace them with a hardy species more native than not that will help maintain the forest’s overall health.